Not to be confused with mourning dress. Emperor Hirohito of Japan, U.S. President Ronald Reagan and his wife Nancy in 1983, both men in morning coats with formal trousers, known as morning dress. Morning dress, also known as formal day dress, is the formal Western dress code for day attire, consisting chiefly of, for men, a morning coat, waistcoat, and formal trousers, and an appropriate gown for women. Men may also wear a popular variant where all parts (morning coat, waistcoat and trousers) are the same colour and material, often grey and usually called "morning suit" or "morning grey" to distinguish it; considered properly appropriate only to festive functions such as summer weddings and horse races, which consequently makes it slightly less formal. The correct hat would be a formal top hat, or if on less spacious audience settings optionally a collapsible equivalent opera hat. The semi-formal counterpart of this code is the stroller. Morning dress is now rarely worn as anything other than formal wear, as a form of civic dress, e.g., by provincial mayors (as an alternative to court dress), but more generally only for weddings, some official civic, governmental or royal functions, 'social season' events, e.g., races such as Royal Ascot (where it is obligatory in the Royal Enclosure) and at Epsom in the Queen's Stand on Derby Day, formal lunches (especially those in the City of London institutions, notably of the livery companies and guilds) and as uniform at some of Britain's most traditional schools such as Harrow (on Sundays) and Eton. It may also be seen sometimes worn at services in St Paul's Cathedral, London and St Giles' Cathedral, Edinburgh. Debrett's states that morning dress should not be specified as the dress code for events starting after 6pm ; if a formal event will commence at or after 6pm, white tie or black tie should be specified instead. The name originated from the practice of gentlemen in the nineteenth century riding a horse in the morning with a cutaway front, single breasted morning coat. The modern twentieth century morning dress was originally a more casual form of half dress, but as the nineteenth century progressed it gradually became acceptable to wear it in more formal situations instead of a frock coat. In the Edwardian era it took over in popularity from the frock coat as the standard daytime form of men's full dress. When it was regarded as a more casual coat, it was common to see it made with step collars (notched lapels in American English), but as it took over from the frock coat in formality it began to be made with the more formal pointed lapels (peaked lapels in American English). 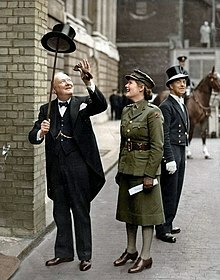 Winston Churchill in morning dress, lifting his top hat with his walking stick. a morning coat (the morning cut of tailcoat), now always single breasted with link closure (as on some dinner jackets) or one button (or very rarely two) and with pointed lapels, may include silk piping on the edges of the coat and lapels (and cuffs on older models with turnup coat sleeves). a waistcoat, which matches the material of the coat. a pair of formal striped or checked trousers worn with braces. either a turndown collar is worn (white detachable, fastened by collar studs; or attached) with a tie, in which case the shirt has double cuffs. a plain or patterned silk handkerchief or pocket square may be worn; it is folded and inserted into the front breast pocket of the morning coat. black Oxford shoes or dress boots, or boots with a horse riding connection, such as George or Chelsea boot, or galosh-top dress boots; worn with plain dark socks (or another colour if they cannot be seen). If the trouser cloth matches the coat, the ensemble becomes a morning suit. The waistcoat may also match, or not (an "odd waistcoat"). Morning suits will sometimes be a middle-tone grey. Morning suits, especially the lighter-toned ones, are considered slightly less formal than morning coat ensembles. a top hat, either classic silk plush, or a modern Melusine fur (replacement for silk plush, as it is no longer in mainstream manufacture). Alternatively, a top hat made of fur felt or wool felt, is another common option. Considered slightly less formal by some, a morning suit can be worn in variant sometimes referred to as "morning grey dress", which has mid-grey matching morning coat, waistcoat, and trousers (all cut the same as above); being more relaxed, this is a traditional option for events in less formal settings such as Royal Ascot, and is now often worn to weddings as well. The modern morning coat is single-breasted and usually has peaked lapels. It is usually closed with a single button but may have a link-front closure instead. It is traditionally in either black or Oxford grey herringbone wool, which should not be too heavy a weight, with curved front edges sloping back into tails of knee length. The coat may feature ribbon braiding around the edges of the collar, lapels, and down around the tails; it may also be present on the hook vent, breast pocket, and sleeves. Nicholas Storey advises that braiding should be avoided for very formal morning wear. A black morning coat with matching black waistcoat is the most formal option, being worn for Court, funerals, memorial services, civic dress and diplomatic dress (replacing or supplementing Court Dress), with academic dress, or in government use in America. At social or festive occasions, e.g. races and weddings, a contrasting waistcoat is worn. The most traditional colours are dove grey, light grey (including pearl grey), buff or camel (both yellowish tan colours), duck-egg blue, and occasionally white. There has been a tendency towards 'fancy' waistcoats of multicoloured and embroidered materials such as brocade, especially at weddings, although brightly coloured waistcoats may be considered garish. Other colours sold by traditional English tailors include pastels such as powder blue, pale pink, pale green, and other pastels. Generally, traditional waistcoats are made from linen, silk, or wool. Waistcoats may be either single-breasted with, or without, lapels or double-breasted with lapels. Single-breasted models with lapels usually feature a step collar and are worn with the bottom button undone, whilst double-breasted models commonly have either a shawl collar or a peak lapel and are worn fully buttoned. In either case, Debrett's advise against wearing backless waistcoats because they do not look as smart as real ones. Sometimes a white slip is worn, which is a strip of fabric buttoned to the inside top of the waistcoat to simulate the effect of a paler under-waistcoat, though the actual wearing of two waistcoats was obsolete even for the late Victorians. The formal ('spongebag') trousers worn with it are either 'cashmere' striped, or black and white checked. Formal trousers should not have turn-ups (cuffs in American English), and have either flat-fronts or one to two forward pleats to each leg. Braces (suspenders in American English) may be worn to prevent the waistband from appearing beneath the waistcoat if required. Belts should not be worn with morning dress. Less common (and less formal) alternatives to striped trousers are houndstooth check, Prince of Wales check, and grey flannel trousers, amongst others. Since the Second World War, in the United Kingdom and Commonwealth Realms, the traditional shirt for morning dress has been a white or light-coloured shirt with double cuffs (fastened with cufflinks) and a plain white stiff turn-down collar (often of the cutaway variety) worn with a long tie. A detachable collar is no longer considered to be necessary and is very formal by modern standards. Alternatively, a wing collar may be worn; the combination of long tie and wing collar is very dated, so these are instead paired with an Ascot. Unfortunately, this combination has acquired negative connotations because most dress hire companies have used pre-tied or incorrect patterns for many years, which has caused the configuration to be seen as an inferior or hired look. Consequently, Debrett’s (and the late Hardy Amies) consider the wing collar and Ascot to be inappropriate for weddings or morning dress, reserving wing collars for white tie. If a wing collar is worn, the collar should be of the starched, detachable, variety and also include starched single cuffs (secured with cufflinks) all in white. This is because, in the past, a starched stiff-fronted shirt was worn with starched cuffs and a starched detachable wing collar, worn with cufflinks and shirt studs; it is essentially the same as a plain-fronted (rather than Marcella) full evening dress shirt. Contemporary shirts often do not have a detachable collar at all which, provided they have the same height and stiffness as the detachable type, are considered to be an acceptable alternative. The most formal colour for a shirt is white but, if a coloured or striped shirt is worn, it should have a contrasting white collar (and possibly cuffs). Traditional formal shirtings are usually light-coloured and may include cream, blue (such as Wedgwood blue), pink, lavender, peach, salmon, yellow, or pastel green. Morning dress shirts (other than the collar) are usually solid in colour or have thin vertical stripes but may have a slightly bolder pattern such as a houndstooth or glencheck. Previously, a grey or (if at a funeral) a black necktie was obligatory. Now all colours are worn; in many clubs and societies the club tie is acceptable to distinguish members from guests at formal lunches and breakfasts. The original silver Macclesfield design (a small check) is still used particularly with cravats, and is often called a wedding tie. Wearing a silver-grey silk tie is the usual practice at royal and other formal events. Although there is no longer a strict rule governing the colour and pattern of ties that are worn to weddings these days, garish options are inadvisable.The English etiquette authority, Debrett's, dictate that smart woven silk ties are preferred to cravats although stocks and cravats may be worn as an alternative. The American etiquette authority, The Emily Post Institute, states that either a tie or a dress ascot may be worn with a morning coat. If worn, cravats may be tied in either a formal dress knot (Ascot knot) which is secured with a cravat pin or a slightly less formal ruched knot which resembles a four-in-hand tie. A wing collar and cravat may be worn with a black coat but not with a grey one. Cravats have been proscribed in the Royal Enclosure at the Royal Ascot since 2012 and should therefore be treated with caution in any context in the United Kingdom and other Commonwealth realms. Bow ties may be worn as an alternative to the necktie. Although there are photographs of the Duke of Windsor and Sir Winston Churchill wearing bow ties with morning dress, and Debrett's does not proscribe the wearing of one, it is not expressly provided as an option by Debrett's and should therefore be treated with caution in the United Kingdom and other Commonwealth realms. Some style authorities, including Bernhard Roetzel and Nicholas Antongiavanni, advise against the wearing of bow ties with morning dress. 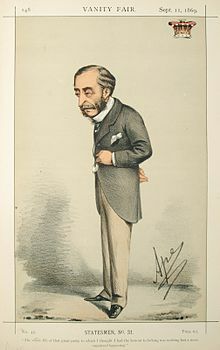 Others, such as Nicholas Storey, provide that bow ties may be worn so long as they are obviously not an evening bow tie. Shoes should be of the traditional, highly polished black plain cap-toe Oxford type without brogueing but may include a single line of tooling across the toe cap. The shoes should not be patent leather, which is now reserved for evening formal wear. Although it may be acceptable to wear 'smart-slip on shoes' and monkstraps, it is not ideal to wear either loafers or open-laced shoes, such as derby shoes (or bluchers in American English). In the Victorian and Edwardian era button boots and Oxford boots were worn and these can be correctly worn with morning dress today. When worn at equestrian events, boots of equestrian origin such as jodhpur boots, George boots and Chelsea boots are also acceptable. Socks should be black or grey. Spats were once frequently seen with morning dress, but are now rarely worn and, by 1939, the practise of wearing them was considered to be almost extinct. A. Carnegie and Lord Weardale. While the top hat would be considered the standard, alternatives occur; here a bowler hat. 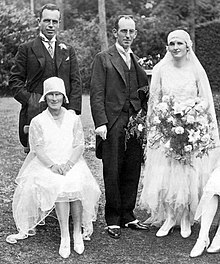 In the Commonwealth of Nations, traditional black, or grey (less formal, but becoming more widely accepted), top hats are considered an optional accessory for weddings. However, hats remain compulsory in the Royal Enclosure at Royal Ascot. A pocket square should always be worn with morning dress. They may be made from linen, cotton, or silk. Whilst a simple white linen square with rolled edges is classic, they may instead be a solid colour or patterned and should always complement the neckwear. In respect of ties and pocket squares, it is considered particularly elegant to pair one of those accessories, which is made from silk, with the other, made from a non-lustrous material such as linen or cotton. This helps to counterbalance the potential for affectations. Although it is very common practice in wedding parties, many style authorities do not recommend matching a pocket square to a tie as it tends to look contrived, draw attention away from the wearer's face, and display sartorial uncertainty. Pocket squares with a solid colour should generally be paired with a patterned tie (and vice versa) and should not share the same base colour. If the pocket square is patterned, it should likewise not match the tie but instead complement it. It may be puffed or folded into a square, single-point, or multi-pointed style folds. Puffed pocket squares work well with softer materials such as silk; other folds tend to hold their shape better when more structured materials such as linen are used. The wearing of decorations, orders, and medals is uncommon with morning dress. An invitation will generally indicate whether or not they should be worn and, in the United Kingdom and Commonwealth Realms, are more common for religious services or public functions of official significance. Up to four stars, one neck badge, and full-size medals should be worn with morning dress; when a neck badge and star are worn together, they must be of different orders. Men in morning dress for a wedding (1929). Men wear morning dress when members of a wedding party. In common with court dress, mess dress, and white tie, morning dress is for prestigious and important social occasions. Despite its name, morning dress may be worn to afternoon social events before five o'clock, but not to events beginning after seven o'clock in the evening; the term "morning" is best understood as "daylight". In Europe, the groom sets the sartorial tone: the guests may wear morning dress if he does. In fiction or popular culture, it may be used to refer, possibly satirically, to a rich ruling class, for example in cartoons. Following the etiquette of formal wear, morning dress being its civilian day wear, there are several equivalents. White tie is the correct, equivalent formal dress for evening social events. The cutaway front of the morning tail coat differs from the evening tail coat (dress coat) in that the waist of the former is cut obliquely while the waist of the latter is cut horizontally, and the tail is cut differently from the swallow tailcoat used for evening dress. The skirt waist construction of the coats is equestrian in origin, to ease the wearer's riding his horse. Women should wear 'smart daywear', such as a smart day dress or a skirt worn with a jacket. The straps of tops and dresses should be at least one inch wide even if worn with a jacket or other covering. Strapless, off-the-shoulder, one shoulder, halter neck, sheer, bardot, and spaghetti straps are not permitted in the Royal Enclosure at the Royal Ascot and may be inadvisable at other occasions that require morning dress. Dresses and skirts should be neither too short nor too revealing. At their shortest, they should fall just above the knee. Trouser suits and smart jumpsuits are permissible at the Royal Ascot but must be ankle length. With trouser suits, the coat and trousers should match in both material and colour. Jumpsuits must also comply with the regulations that apply to skirts and dresses. At the most formal of occasions and the races, dresses and skirts should be worn with a tailored jacket. A bolero, shrug, or pashmina may otherwise be worn. Daytime shoes, such as wedges, should be worn rather than very high heels or evening-style shoes and ought to be comfortable enough to wear for several hours. Tights should always be worn. Hats should be worn in the Royal Enclosure at the Royal Ascot but are optional at weddings. They should be a style that is securely fitted and may be worn throughout the day. Hats should neither be so large or cumbersome that they hamper kissing nor too small. The Royal Ascot does not permit fascinators within the Royal Enclosure. Headpieces may be worn instead of a hat but must have a solid base of at least 10cm. Daytime jewellery, such as pearls, add an extra flourish of style. A shoulder bag is often preferable to a clutch purse, especially for mothers at weddings. In Britain, morning dress is worn to certain equestrian events (such as Royal Ascot and The Derby). In Australia, morning dress is the traditional dress for those attending the Victoria Derby. It is also worn in Commonwealth of Nations countries, such as Australia and New Zealand, by the male members of a wedding party. Men at upper and upper-middle class weddings usually wear their own morning coats and their own ties. On these occasions they may wear their old public (U.S.: private) school ties. It is occasionally worn by the British working class (constituting the majority of the population) for only the wedding party to wear morning 'suits'. These tend to be hired and far more co-ordinated than those worn by their upper-middle and upper-class counterparts. The men usually dress in identical, hired, outfits along with identical ties, handkerchiefs and waistcoats. Joseph Douglass in morning dress with grandfather Frederick Douglass in frock coat (circa 1890s). In the U.S., the morning coat is sometimes referred to as a cutaway coat. In the U.S., morning dress is rare; it usually is worn in traditional weddings and political formal events, although the Kennedy inauguration of 1961 was the last use for that ceremony. In Virginia, morning dress is worn by a governor-elect when sworn to office. The United States Solicitor General and deputies wear morning coats during oral argument before the United States Supreme Court, as do the Marshal and Clerk of the court during all sessions of the court, unless they are female. Morning dress has recurred in the traditional Easter parade associated with Fifth Avenue in New York City. The stroller is a similar, but slightly less formal, dress code, hence not interchangeable with full morning dress. Where morning dress is the daylight equivalent of evening's white tie, the stroller is a formal revamp of the lounge suit and the daylight equivalent of black tie. ^ a b c d e f g h i j k l m n o p q r s t u v w x y z aa ab ac ad ae af Wyse, Elizabeth (2015). Debrett's Handbook. Mayfair, London: Debrett's Limited. p. 190. ISBN 978-0-9929348-1-1. ^ "Morning Suits - Cad & the Dandy". Archived from the original on 2012-10-19. ^ Donald, Elsie, ed. (1981). Debrett's Etiquette and Modern Manners. London: Debrett's Peerage Limited. pp. 385–386. ISBN 0-905649-43-5. ^ Antongiavanni, Nicholas (2006). The Suit. New York: HarperCollins Publishers. p. 169. ISBN 978-0-06-089186-2. ^ Keers, Paul (1987). A Gentleman's Wardrobe: Classic Clothes and the Modern Man. London: Weidenfeld & Nicolson. p. 105. ISBN 0-297-79191-5. ^ Tuckerman, Nancy; Dunnan, Nancy (1995). The Amy Vanderbilt Complete Book of Etiquette: 50th Anniversay Edition (1 ed.). New York: Bantam Doubleday Dell Publishing Group Inc. p. 284. ISBN 978-0-385413428. ^ Post, Anna; Post, Lizzie (2014). Emily Post's Wedding Etiquette (6 ed.). New York: The Emily Post Institute, Inc. p. 260. ISBN 978-0-06-232610-2. ^ "Existing Customs 2016" (PDF). Harrow School. Retrieved 3 November 2018. ^ "Some Notes on Dress at Eton College". Keikari. Keikari. Retrieved 3 November 2018. ^ Wyse, Elizabeth (2015). Debrett's Handbook. Mayfair, London: Debrett's Limited. pp. 185–187. ISBN 978-0-9929348-1-1. ^ Wyse, Elizabeth (2015). Debrett's Handbook. Mayfair, London: Debrett's Limited. pp. 187–189. ISBN 978-0-9929348-1-1. ^ "Wedding Suits - A Suit That Fits". ^ a b c d Hume, Lucy (2017). Debrett's Wedding Handbook. Mayfair, London: Debrett's Limited. p. 116. ISBN 978-0-9929348-4-2. ^ Antongiavanni, Nicholas (2006). The Suit. New York: HarperCollins Publishers. p. 177. ISBN 978-0-06-089186-2. ^ Keers, Paul (1987). A Gentleman's Wardrobe: Classic Clothes and the Modern Man. London: Weidenfeld & Nicolson. p. 104. ISBN 0-297-79191-5. ^ Post, Peggy; Post, Anna; Post, Lizzie; Post Senning, Daniel (2011). Emily Post's Etiquette (18 ed.). New York: The Emily Post Institute, Inc. p. 619. ISBN 978-0-06-174023-7. ^ a b Amies, Hardy (2013). The Englishman's Suit. London: Quartet Books Ltd. p. 82. ISBN 978-0-7043-7169-9. ^ Storey, Nicholas (2008). History of Men's Fashion: What the Well-Dressed Man is Wearing. Barnsley: Pen & Sword Books Ltd. pp. 73–74. ISBN 978-1-84468-037-5. ^ Storey, Nicholas (2008). History of Men's Fashion: What the Well-Dressed Man is Wearing. Barnsley: Pen & Sword Books Ltd. p. 74. ISBN 978-1-84468-037-5. ^ Schneider, Sven (2017). Morning Dress Guide (1 ed.). Saint Paul, Minnesota: Gentleman's Gazette LLC. p. 94. ^ Storey, Nicholas (2008). History of Men's Fashion: What the Well-Dressed Man is Wearing. Barnsley: Pen & Sword Books Ltd. pp. 74 & 79. ISBN 978-1-84468-037-5. ^ Storey, Nicholas (2008). History of Men's Fashion: What the Well-Dressed Man is Wearing. Barnsley: Pen & Sword Books Ltd. p. 79. ISBN 978-1-84468-037-5. ^ a b Keers, Paul (1987). A Gentleman's Wardrobe: Classic Clothes and the Modern Man. London: Weidenfeld & Nicolson. pp. 104–105. ISBN 0-297-79191-5. ^ Wyse, Elizabeth (2015). Debrett's Handbook. Mayfair, London: Debrett's Limited. p. 297. ISBN 978-0-9929348-1-1. ^ Wyse, Elizabeth (2015). Debrett's Handbook. Mayfair, London: Debrett's Limited. p. 302. ISBN 978-0-9929348-1-1. ^ Pullman, Nigel. "Dress codes" (PDF). Livery Companies of the City of London. Retrieved 17 October 2018. ^ Schneider, Sven (2017). Morning Dress Guide (1 ed.). Saint Paul, Minnesota: Gentleman's Gazette LLC. p. 128. ^ a b c d e f g Roetzel, Bernhard (2009). Gentleman: A Timeless Guide to Fashion. Cambridge: Tandem Verlag GmbH. p. 331. ISBN 978-3-8331-5270-2. ^ a b c d e f g h i j k l m Hume, Lucy (2017). Debrett's Wedding Handbook. Mayfair, London: Debrett's Limited. p. 117. ISBN 978-0-9929348-4-2. ^ Storey, Nicholas (2008). History of Men's Fashion: What the Well-Dressed Man is Wearing. Barnsley: Pen & Sword Books Ltd. p. 77. ISBN 978-1-84468-037-5. ^ a b Flusser, Alan (2002). Dressing The Man: Mastering the Art of Permanent Fashion. New York: HarperCollins Publishers Inc. p. 284. ISBN 978-0-06-019144-3. ^ Bryant, Jo; Wyse, Liz, eds. (2012). Debrett's Men's Style. Richmond, Surrey: Debrett's Limited. p. 22. ISBN 978-1-870520-00-3. ^ Schneider, Sven (2017). Morning Dress Guide (1 ed.). Saint Paul, Minnesota: Gentleman's Gazette LLC. p. 129. ^ Schneider, Sven (2017). Morning Dress Guide (1 ed.). Saint Paul, Minnesota: Gentleman's Gazette LLC. pp. 136–138. ^ Storey, Nicholas (2008). History of Men's Fashion: What the Well-Dressed Man is Wearing. Barnsley: Pen & Sword Books Ltd. pp. 77–78. ISBN 978-1-84468-037-5. ^ a b Hume, Lucy (2017). Debrett's Wedding Handbook. Mayfair, London: Debrett's Limited. pp. 116–117. ISBN 978-0-9929348-4-2. ^ Schneider, Sven (2017). Morning Dress Guide (1 ed.). Saint Paul, Minnesota: Gentleman's Gazette LLC. p. 233. ^ Storey, Nicholas (2008). History of Men's Fashion: What the Well-Dressed Man is Wearing. Barnsley: Pen & Sword Books Ltd. p. 78. ISBN 978-1-84468-037-5. ^ Storey, Nicholas (2008). History of Men's Fashion: What the Well-Dressed Man is Wearing. Barnsley: Pen & Sword Books Ltd. pp. 75–76. ISBN 978-1-84468-037-5. ^ Antongiavanni, Nicholas (2006). The Suit. New York: HarperCollins Publishers. pp. 169–170. ISBN 978-0-06-089186-2. ^ Amies, Hardy (2013). The Englishman's Suit. London: Quartet Books Ltd. pp. 82–83. ISBN 978-0-7043-7169-9. ^ Amies, Hardy (2013). The Englishman's Suit. London: Quartet Books Ltd. pp. 77–78. ISBN 978-0-7043-7169-9. ^ Wyse, Elizabeth (2015). Debrett's Handbook. Mayfair, London: Debrett's Limited. p. 185. ISBN 978-0-9929348-1-1. ^ Wyse, Elizabeth (2015). Debrett's Handbook. Mayfair, London: Debrett's Limited. p. 188. ISBN 978-0-9929348-1-1. ^ Schneider, Sven (2017). Morning Dress Guide (1 ed.). Saint Paul, Minnesota: Gentleman's Gazette LLC. pp. 147–150. ^ Schneider, Sven (2017). Morning Dress Guide (1 ed.). Saint Paul, Minnesota: Gentleman's Gazette LLC. p. 151. ^ "Royal Ascot Style Guide | Ascot". www.ascot.co.uk. Retrieved 2018-10-17. ^ Schneider, Sven (2017). Morning Dress Guide (1 ed.). Saint Paul, Minnesota: Gentleman's Gazette LLC. p. 195. ^ Antongiavanni, Nicholas (2006). The Suit. New York: HarperCollins Publishers. p. 171. ISBN 978-0-06-089186-2. ^ Schneider, Sven (2017). Morning Dress Guide (1 ed.). Saint Paul, Minnesota: Gentleman's Gazette LLC. pp. 196–200. ^ Schneider, Sven (2017). Morning Dress Guide (1 ed.). Saint Paul, Minnesota: Gentleman's Gazette LLC. p. 201. ^ Mansfield, Alan; Cunnington, Phillis (1973). Handbook of English Costume in the 20th Century 1900-1950. London: Faber and Faber Limited. p. 338. ISBN 0-571-09507-0. ^ Antongiavanni, Nicholas (2006). The Suit. New York: HarperCollins Publishers. p. 170. ISBN 978-0-06-089186-2. ^ Hanson, William (2014). The Bluffer's guide to etiquette (First ed.). p. 72. ISBN 978-1-909937-00-0. ^ Wyse, Elizabeth (2015). Debrett's Handbook. Mayfair, London: Debrett's Limited. pp. 436–437. ISBN 978-0-9929348-1-1. ^ See also depictions in Puttin' on the Ritz. ^ a b c d e f g "Ladies - What to Wear: Royal Enclosure". Royal Ascot. Ascot Racecourse. Retrieved 2 November 2018. ^ a b c Hume, Lucy (2017). Debrett's Wedding Handbook. Mayfair, London: Debrett's Limited. p. 124. ISBN 978-0-9929348-4-2. ^ Elsie Burch Donald (1981). Debrett's Etiquette and Modern Manners. p. 56. ISBN 0-7472-0657-0. ^ Times-Dispatch, NED OLIVER Richmond. "Trumpets, morning coats and ham: What to expect at Ralph Northam's inauguration Saturday". Richmond Times-Dispatch. Retrieved 2019-01-09. ^ "The Court and Its Traditions". Supreme Court of the United States. Retrieved 7 November 2018. ^ "William Suter, Clerk of the U.S. Supreme Court, interview, C-SPAN U.S. Supreme Court Week". Supremecourt.c-span.org. Retrieved 2012-06-18. Apparel Arts magazine, an account of 1930s fashion and style; some issues more relevant than others, such as those reproduced with comment at The London Lounge. Bryant, Jo; Wyse, Liz, eds. (2012). Debrett's Men's Style. Richmond, Surrey: Debrett's Limited. ISBN 978-1-870520-00-3. Donald, Elsie, ed. (1981). Debrett's Etiquette and Modern Manners. London: Debrett's Peerage Limited. ISBN 0-905649-43-5. Flusser, Alan (2002). Dressing the Man: Mastering the Art of Permanent Fashion. HarperCollins. ISBN 978-0-06-019144-3. Keers, Paul (1987). A Gentleman's Wardrobe: Classic Clothes and the Modern Man. London: Weidenfeld & Nicolson. ISBN 0-297-79191-5. Mansfield, Alan; Cunnington, Phillis (1973). Handbook of English Costume in the 20th Century 1900-1950. London: Faber and Faber Limited. ISBN 0-571-09507-0. Pullman, Nigel. "Dress codes" (PDF). Livery Companies of the City of London. Retrieved 17 October 2018. Schneider, Sven (2017). Morning Dress Guide (1 ed.). Saint Paul, Minnesota: Gentleman's Gazette LLC.